Figure 6 Isli Lake (left) and Tislit Lake (right) - two substantial hard water lakes in the High Atlas Mountains (Morocco). Figure 7 North shore of Lake (Birket) Qarun (April 2003) - a salty lake at the margin of the hyper-arid Egyptian western desert. Note the absence of both vegetation and run-off drainage features on this shore. saline, and rainfall is not the main source of water. They can be independent water bodies without inflows or outflow channels (or both) and examples are the group of salty lakes at the Siwa Oasis in the western desert of Egypt, where they are sustained by artesian water supply. 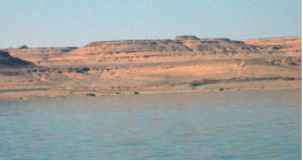 Other birkets are dependant on River Nile, and Birket Qarun, for example, is a substantial 40-km long lake on the margin of the Great Western Desert (Figure 7). 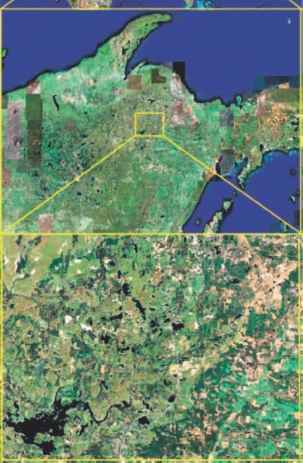 The lake is fed by Nile water through the Bahr Yusef canal, and although it was formerly a larger and essentially a freshwater lake, hydrological and other changes in the last 100 years or so have induced strong salinization. The salinity of the lake water is around that of sea-water (depending on season and location), and the site has developed an interesting part marine fauna, including molluscs (Cerastoderma), crustaceans, several fish species (Solea), and even a few sea anemones.